Join us on a learning expedition! 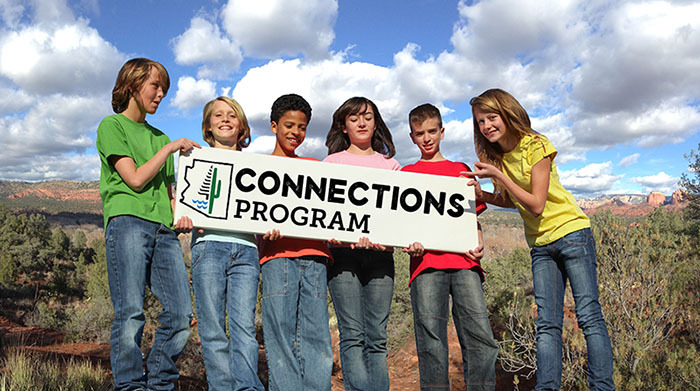 Red Rock State Park's Connection Program makes science relevant, meaningful and exciting by utilizing the natural environment as a hands-on classroom for K-9 students. Our goal through environmental education is to connect the knowledge gained by students in traditional classrooms with engaging outdoor learning experiences that support cognitive development and scientific inquiry skills. Students are inspired by personal discoveries and in turn develop an understanding of the interconnections around them. Lessons are aligned with Arizona State Standards and facilitated by Park Rangers and Volunteers who are dedicated to fostering the intrinsic sense of wonder to which young learners are prone. An adventure awaits your students at Red Rock State Park! We explore all of the possibilities and bring out the scientist in everyone! The brochure attached below explains the unique educational opportunities we offer, and the program coordinator is available to help you plan your group’s field trip.